When you take that first sip of coffee, what do you taste? Can you distinguish the different flavours or does it just taste like “coffee”? Just to name a few, coffee releases different aromas and flavours such as berries, caramel, and chocolate. The taste of the coffee reflects on the origin of beans, how and where they were grown, how they’re roasted and finally the brewing method. The SCAA Coffee Tasters Flavour Wheel was created to provide common language so people can discuss coffee in a way that is mutually understandable. The colourful wheel was made to distinguish our description of smell, taste, and flavour. It represents a comprehensive, kaleidoscopic picture of coffee flavour. There are 3 different tiers of flavours that represent the wheel. Firstly, simply taste some coffee…start in the center which is TIER 1: Lets go with ‘Fruity’ . Then, ask yourself “can I taste fruity-ness in the coffee?” “What kind of fruit?” TIER 2: Dried fruit, citrus fruit, berries?... From there, you break down the tastes. If you taste citrus fruit, determine what kind of citrus fruit TIER 3: Lemon, lime, grapefruit etc. The most general taste descriptors are near the center, and as you work outwards the tiers become more specific. Work your way outwards then go back to the middle and start again. On the Flavour Wheel you will notice gaps between each flavours. The gaps indicate how closely related flavours are to each other. No gap means that the flavours are very similar, a small gap means that the flavours are less similar and a large gap means that there is very little or no similarity in flavour. You don’t want to be tasting the ‘Other’ category on the wheel, which is in the blue and grey area. This is where you’ll taste chemical or papery/musky such as bitter, stale, and woody. 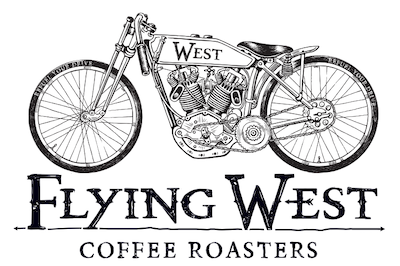 At Flying West, the Flavour Wheel can be beneficial when we roast and during cupping sessions. This plays a big part when it comes to developing our tasting palettes. 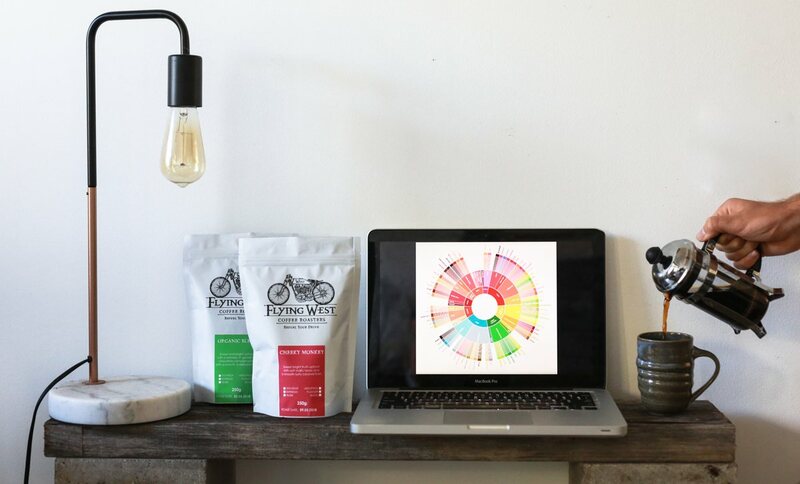 Using the Flavour Wheel we are able to analyze our coffee’s flavour, aromas and taste. -Next time you have a cup of coffee see if you can identify any specific aromas and flavours. -Use the Coffee Tasting Flavour Wheel, study the colours, and use your words no matter how silly you may sound! -Try different blends OR Single Origins of coffee and awaken your taste buds!